Code: Europe is a decent edutainment title that looks and feels very similar to Broderbund's famous Carmen Sandiego games, but much less engaging or original. Cast as a secret agent, your job is to catch the thieves who stole some treasure by correctly following their routes and cornering them in the correct European city. 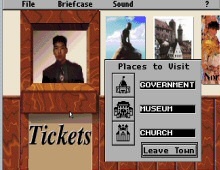 Each mission spans only 3 European countries of your choice, although the game is more challenging overall than Carmen Sandiego because the trivia questions are considerably more difficult. As in the Carmen games, you must accomplish each mission within the alloted number of days and budget. Informers in each city will first tell you a factoid about that country, then ask you a multiple-choice question. If you answer correctly, you will get a clue or a puzzle item. Complete enough missions, and you will be promoted and given more difficult assignments. The graphics in Code: Europe is more than decent, but the game overall is too banal to occupy anyone - let alone kids - for long. Not recommended, unless you or your kids have already played all Carmen Sandiego games, or want a brush up on your knowledge of Europe.